NetBeans Community day took place on Sunday 28th September. ‘Community’ is the key word here and it featured a wide range of speakers talking about how they use NetBeans. It was focussed on the two issues (Maven and NetBeans in education) flagged as most interesting by the NetBeans Community. 1. 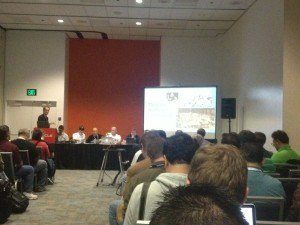 Meet the NetBeans Community, with Boeing, Jelastic, JRebel, Vaadin, and More! Geertjan updated everyone on how NetBeans has progressed in the last 12 months. NetBeans 8 was released and already NetBeans 8.0.1 is available. It has also seen significant growth in Social media and NetBeans is on Facebook, Twitter and has its own Youtube channel. An excellent sign of general NetBeans growth has been the rash of new books (both on NetBeans and on Java in general which choose to standardise on NetBeans as an IDE). NetBeans is a very extensible platform and speakers from Boeing, Jelastic, JRebel, Vaadin showed how they were providing plugins on the NetBeans IDE. Boeing showed their Engineering platform (which is built ontop of NetBeans) and which they hope to Open Source in the near future. James Gosling hosted a session. He showed off his marine robots and talked about the channels of the environment (salt water and electronics do not mix well). He showed some realtime activity from Black widow. All robots are named after superheroes. Robots electronics essentially cell phone level hardware (ARM) in a very protective box – salt water is a problem. Another speak produced a real black box and showed RaspberryPi being used for data logging device. It was very impressive to see a speaker from Spain show a web cam with data feedback from his home in Spain and switch off his house lights remotely. The combination of Raspberry Pi and NetBeans works really well and there were several demos of custom hardware projects. This session focussed on using NetBeans with Maven. There were demos of how to graphically access the POM and how Maven solves lots of implementation problems. There was also a demo of FindBugs and PMD – which can be used in both NetBeans and in Maven to improve code quality. There was a demo of how simple it is to maintain dependencies in Maven with NetBeans. Ben Evans finished by porting an application from JavaEE6 to JavaEE7 in 5 minutes. I was really pleased to learn from Ben also that he has updated O’Reilly’s Java in a Nutshell with a new 6th Edition. It was my first Java book and long overdue a new update. David Heffelfinger showed how easy NetBeans makes it to build JavaEE applications without writing code and the other speakers showed how they had used the NetBeans platforms to build applications which would have been just too much work otherwise and not a core focus. NetBeans is being used in a wide range of commercial applications in lots of different sectors. This session looked at issues in education. It was especially interesting to see how NetBeans is being used to allow visually-impaired students to write code. C style languages are actually very hard to follow aurally and Quorum is a much easier language which runs on the VM. All the speakers were impressed with the simplicity of NetBeans, the way it runs out of the box and the ways it helps students at many levels with help, hints, templates and ease of use. There is a NetBeans teachers session on Google Plus and a rapidly growing Community. 6. Lightning Talks: Even More Productivity with Free Java Tools! MicroChip showed how they had built their embedded IDE ontop of NetBeans and explained the advantages of using NetBeans as a base. It was a very successful event with lots of information and chances to meet other NetBeans users. I think they may need a bigger room next year….